Like many people I run lots of applications at any one time. It seems that whatever screen size I have, or however many screens I have, they are always full of ‘stuff’. Many experts on the internet say that you should focus on fewer or only one thing. Often the best way to do that is to put your ‘one application’ into full screen mode. 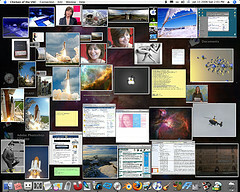 Lots of applications in OSX Lion have that ability, like Safari, and Chrome for example. In fullscreen mode in OSX Lion, the dock disappears, and the banner across the top of the screen also disappears. You should now be on the way to being distraction free! The same key combination gets you out of that uber full screen mode in Google Chrome. Enjoy your distraction free day !